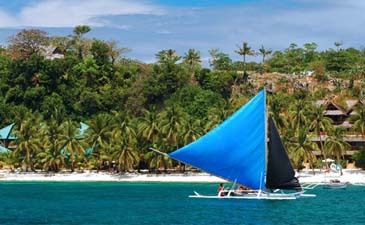 Philippine adventure tourism is rapidly growing in popularity as tourists seek different kinds of vacations. The Philippine Tourism Department's office in London in the United Kingdom had been flooded with calls, after a London-based newspaper featured an article depicting the Philippines as a thriller destination, Ms Maricon Basco-Ebron, tourism director and attache at Philippine Embassy in Seoul said on Sept. 21. She said that on its Sept. 6 issue, the travel section of Daily Mail, a popular British newspaper in tabloid format, with over two million in daily circulation, cited the Philippines as an adventure buffet for the picky tourist in a full-color article titled Manila Really is a Thriller. The two-page article, written by travel writer and famous author Michael Arditti, said there is so much more to the Philippines than Imelda Marco's shoes, young maids exploited by Arab employers, and acute poverty. Arditti, who traveled to Manila, Cebu and Boracay for two weeks, expressed his admiration for the beauty of the Philippines, from the pulsating capital of Manila to the exotic islands. "On a two-week trip, I was able to get a taste of a country which offers not just a huge contrast to life in the West, but a series of striking contrasts within itself. On the other hand, having visited three of its 7,107 islands, I have 7,014 reasons to return," Arditti said. He said there are 20,000 miles of shoreline to explore in the Philippines, which is also home to 40 percent of the world's maritime life. He described Boracay as a true island paradise. Tourism Secretary Ace Durano noted that immediately after the article's publication, "the Department of Tourism in London was flooded with calls." Durano said this proves that the country's image problem can easily be reconditioned by a single person's experience of the country's destinations. For this, he called on bloggers and writers to keep highlighting the best of the country, its undiscovered destinations and hideaways, through photos and words. Tourism Undersecretary Eduardo Jarque Jr. said this is the reason why the government encourages hotels, resorts and airlines to link up with the Tourism Department in familiarization tours campaign to bring in more potential "ambassadors" who will promote the Philippines. Domingo Ramon Enerio, the tourism attaché in London, said the establishments where Arditti stayed, such as Traders Shangri-La, Boracay Tropics, Plantation Bay, Nurture Spa, and TRIPS have also received numerous inquiries after the article's publication.